Vancouver, British Columbia – The ePACT emergency network is honored to work alongside The Ride to Conquer Cancer presented by Silver Wheaton, benefiting BC Cancer Foundation, enhancing safety communication and support to thousands of riders in the 2016 event, this August. By adopting ePACT, the Ride to Conquer Cancer will be able to instantly communicate with the thousands of riders during the event, while also having access to critical health details if someone requires care. If there is an unexpected route change, extreme weather warning, or other issue, organizers can send notifications to all riders and volunteers via text and voice message to ensure their safety and awareness of any impacts. The BC Ride to Conquer Cancer is a two-day cycling journey spanning more than 200 kilometers from Vancouver to Seattle. Since 2009, this inspirational event has raised more than $70 million for the BC Cancer Foundation, supporting breakthrough research and enhancements to care at the BC Cancer Agency. ePACT will provide riders with a secure online network to connect and share critical data that the B.C. Ride to Conquer Cancer team and medical staff need to support participants along the route. Riders will share medical data needed in case of an accident, injury or illness, so that authorized medical support staff and first responders can provide proactive medical care. Riders will also share their contact details and emergency contacts such as their spouse, support team and other riders, with the event. “We are always looking for new opportunities to enhance safety and communication for our riders and ePACT offers a great way to share urgent notifications to the Ride network over the event weekend if necessary,” explains Sarah Roth, President & CEO, BC Cancer Foundation. ePACT is changing the way the world prepares for life’s emergencies. As your emergency network, ePACT better connects and protects your family, organization and community through any crisis. ePACT Network Ltd. is based in North Vancouver, British Columbia. The company was founded by Christine Sommers and Kirsten Koppang Telford in 2012 after speaking with survivors of the 2011 Japan earthquake and tsunami. The ePACT team is made up award-winning entrepreneurs, technologists and usability experts, committed to helping North American communities better manage any crisis. 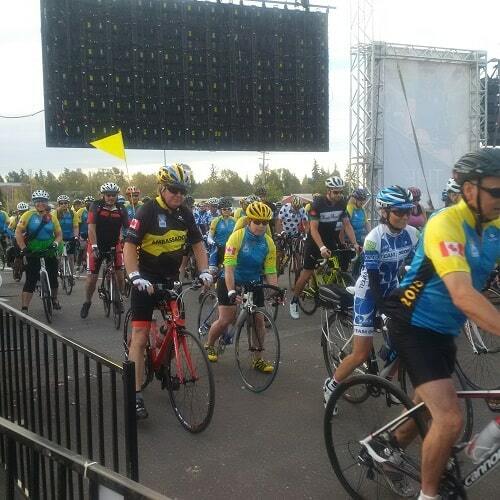 This year’s Ride to Conquer Cancer raised $7.1 million bringing the overall total to $77 million. It also brought together 1,687 riders which included a team from ePACT.